Strap in, because this is a bumpy ride. It involves an Australian soccer club, a small-town newspaper, and a pair of exposed balls. First, let’s meet the Albury Tigers. This solid soccer team plays out of the Albury Sporting Grounds in New South Wales, and receives a good amount of fan support. They also get press attention from the local outlets, including the Border Mail newspaper that covers the Albury-Wodonga community (on the border of New South Wales and Victoria, in case you’re wondering about the name). 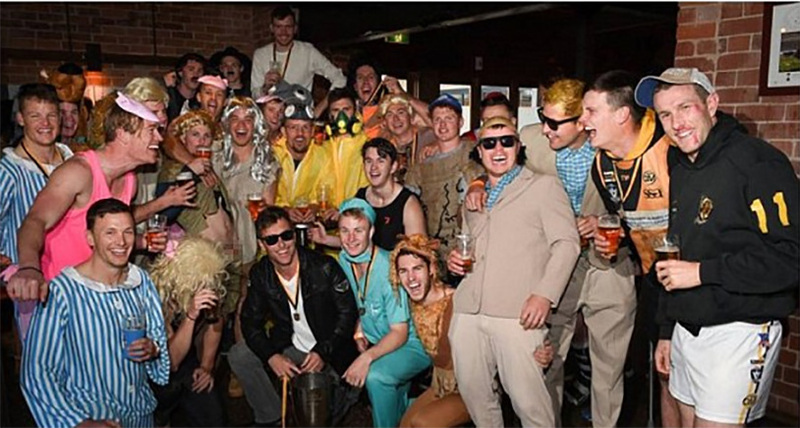 It was only natural that the Border Mail would send a photographer out to the pub to snap the team celebrating during Mad Monday, the traditional end-of-season celebration that sees teams honor retiring players and let loose after hard-played games. However, that photographer probably should have examined the scene more carefully before selecting a group shot for the back page of Tuesday’s edition. The Tigers were feeling extra emotional – their coach Daniel Maher had brought them to a Premiership win that season, and he was also retiring. But we can’t figure out exactly what prompted one of the men in the picture to whip his nutsack out for the photo. Adding insult to injury, the newspaper didn’t notice that there were gonads in the crowd shot and they went to press with the photo. It didn’t take long before social media jumped on the hilarious picture. The man was identified and found to not be a player, but rather a spectator who couldn’t resist the opportunity to make some mischief. He was fined $500 for his cheek, but that might not be the end of the drama for the Tigers – reports of them running boozy riot in the Albury Base Hospital after leaving the pub are starting to hit the wire. Read the full rundown at the Daily Mail.